Located in the northeastern corner of Golden Gate Park (near the Conservatory of Flowers), the Dahlia Garden celebrates the official flower of San Francisco with a diverse spread of colors that grow in a thick, fenced-in treasure trove of blooms. The dahlias at Golden Gate Park start to bloom in June and reach their peak level of beauty in late August and September. However, you can still enjoy the radiance of the blooms all the way into October. As the long days of summer unfold, pay a visit to the Dahlia Garden to enjoy a romantic picnic across the grassy landscape. When looking for exquisite locations to take a photograph in the park, the dahlias provide a colorful backdrop – ideal for engagement photo shoots. You can reserve the Dahlia Dell for your next get-together, but keep in mind that there is only one picnic table, and if you want to enjoy a few hamburgers and hot dogs, you will need to tote your own grill, as none are provided. You can bring your own beer and wine to the dell, but no liquor or kegs are allowed. When partying, never carry an open container of alcohol outside of the picnic area. If you’re looking for a nice game of volleyball or similar fun, please note that the grassy glen of the Dahlia Dell is too narrow to accommodate these activities. The nearest restroom is found on the far (west) side of the Conservatory of Flowers. 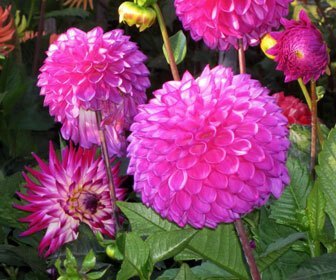 You will find the Dahlia Dell tucked between two walking paths that lead east from the Conservatory of Flowers. Since there is no sign identifying the garden, you will need to keep an eye out for the single picnic table as you walk down the paths. By car, drive towards Conservatory Drive East or JFK Drive – you will find free parking along Conservatory Drive East.